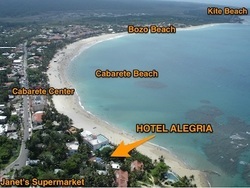 Hotel Alegría is centrally located on the east side of Cabarete Beach (a block from Janet's supermarket), yet it offers a peaceful friendly atmosphere and personalized service that distinguishes this family-run hotel from the larger establishments along the beach. With its 14 rooms, studios and apartment, guests can choose between ground-floor units with kitchenettes or upper-floor units with balconies and ocean views, as well as a ground-floor two-bedroom apartment. 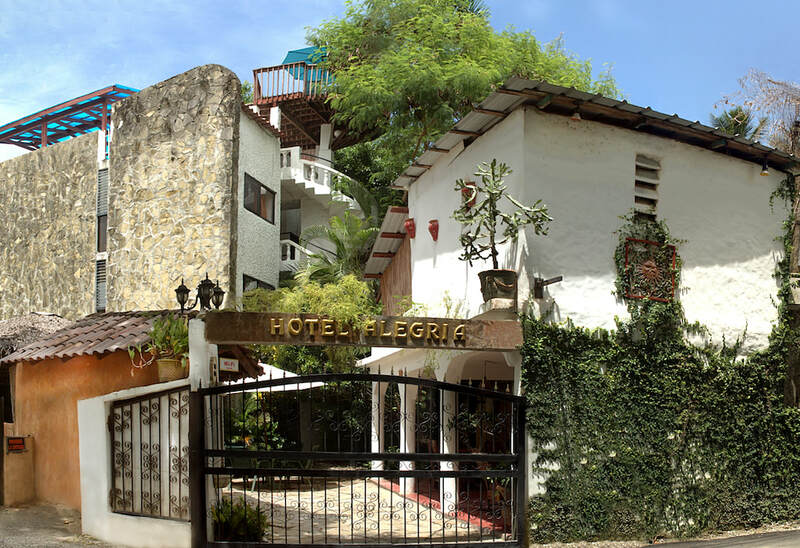 An extra large studio and a two-bedroom apartment are available for groups of four or more. All rooms have private bathrooms, mini-fridge, safe, and cable TV. Air conditioning is available in selected rooms. Wireless Internet is available in all rooms and common areas. Guests may use the hotel computer for Internet access upon request. We will be happy to assist you find the transportation, tours, rentals of water sports equipment and/or lessons that will make your Cabarete vacation complete.